I was 10 years old when Rocky came out in 1976 and it had a huge impact on me. It’s hard to believe that it was more than 35 years ago, but what is really cool is that the film still has cultural relevance. For one, it’s a quintessential underdog story that is referenced still when someone defeats huge odds to succeed whether in sports, politics or just in life. The story also speaks to the American dream of someday rising above your station in life to make it big, something politicians still allude to today when trying to sell their vision for America. And of course, watching it during the NCAA tournament makes you root even harder for the 15 seeds of the world. 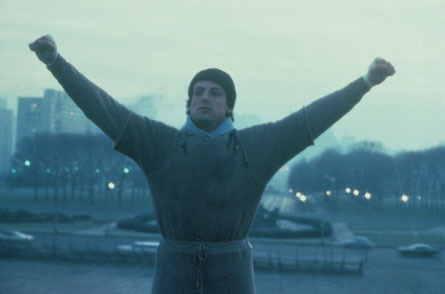 Rocky doesn’t always get a lot of credit for being a great film though…and I think that’s a shame. Yes, it won the 1977 Academy Award for Best Picture, and of course it made this list, but people think of it as a sports movie and it’s really not. In fact, watching it again (for the umpteenth time) I was struck by how few boxing scenes the film includes. The entire bout between Rocky and Apollo Creed took up less than 15 minutes of the film’s 120 minutes. The rest of the film is about Rocky’s struggle prior to getting his shot at the title and his awkward but endearing pursuit of Adrian. This is an everyman who is just trying to get by in life, looking for a way to make a few bucks (legal and otherwise) and looking for a person to share it with. This is really evident in the scene just prior to the fight when he tells Adrian that he doesn’t think he can beat Apollo, but that it’s ok because all he wants to do is go the distance and that in and of itself will prove to him that he has some worth. It was never about winning for Rocky — it was about his own strength and fortitude to survive. A lot of fans didn’t like the fact that Rocky doesn’t win the fight against Apollo, but it was never about winning. I think that’s a mistake a lot of people make when thinking about this film, or other underdog situations (nobody really thinks Lehigh is going to win the NCAA basketball championship, and that’s okay, because simply by doing their best they got through the first round and that’s a huge win on its own). Rocky is also about great performances, none better than Sylvester Stallone’s. Sure, his legacy will be that of an action hero with little talent, but he’ll always have Rocky as proof that he can not only act, but he can write a hell of a screenplay. He was nominated for an Oscar for his portrayal of Rocky, and he was nominated for writing the screenplay as well (a feat only Charlie Chaplin for The Great Dictator and Orson Welles for Citizen Kane accomplished before him). Talia Shire was also wonderful in her Oscar nominated role as the shy Adrian, and Burgess Meredith and Burt Young were also nominated for their roles. It’s rare for a film to have such a recognized ensemble cast at Oscar time and that’s a tribute to great writing and directing. Back to that 10-year-old kid in 1976 — I watched the Academy Awards from our apartment in San Diego that night rooting for Rocky to take home the prize, an underdog not only in theme but for the Oscar going up against the likes of All The President’s Men, Taxi Driver, Network and Bound for Glory and just like in the film the underdog surprised everyone. I think I became a huge movie fan that very night…and I know I played the hell out of the soundtrack (which of course we owned on 8-track) that whole year! That’s funny Len– I had a very similar experience on Oscar night in 1976, rooting for Rocky to win and being ecstatic when it did. I would still probably put it in my top 25 favorite movies of all time.